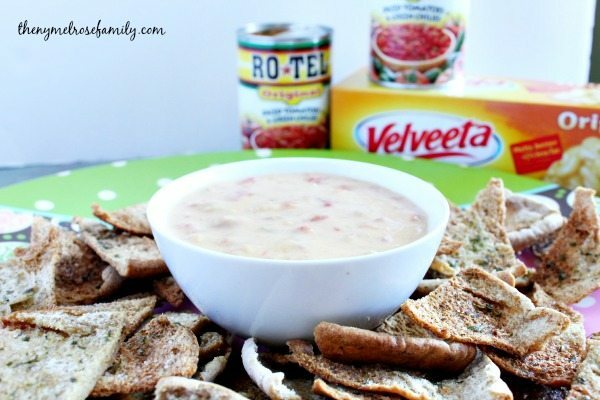 One of my favorite quick and easy appetizers to turn to in a pinch is Ro*Tel & Velveeta Dip. There is very little that you need to do to prepare it. Unless of course you’re like me and you want to have a healthy twist to the dip so you add in some chick peas and make your own Garlic and Parsley Baked Pita Chips. Believe me, you won’t be disappointed. 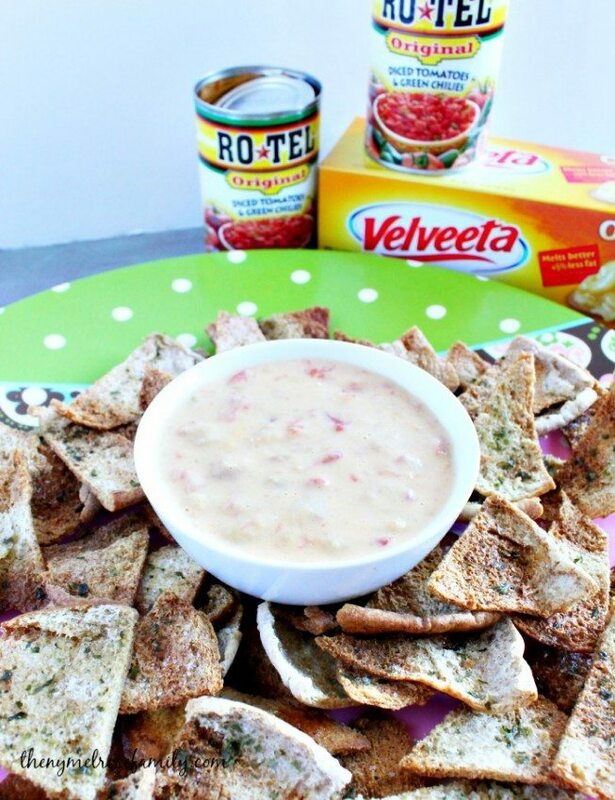 Ro*Tel and Velveeta make the perfect queso dip, but if you’re trying to sneak in extra veggies then our twist of adding mashed chick peas is the perfect queso hack. The reason I love using Ro*Tel is because you don’t need to add in any other spices. It’s the perfect bite of spice on every chip. 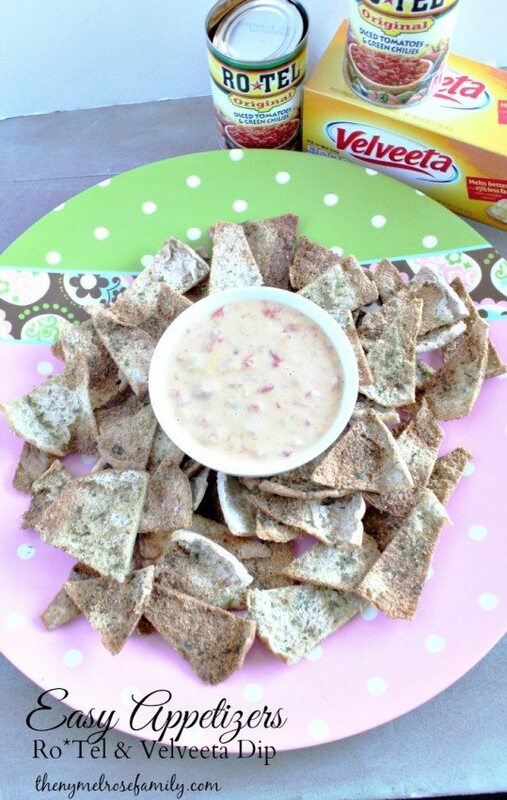 The creaminess of the Velveeta cheese is also the perfect topping for our Garlic & Parsley Baked Pita Chips. Our healthier chips are quick and easy. You’ll need a pack of six whole wheat pitas that you cut into triangle shapes that you place onto a greased baking sheet. Drizzle the chips with extra virgin olive oil and sprinkle with garlic, sea salt and parsley. Bake the chips for 6 – 10 minutes at 350 degrees. 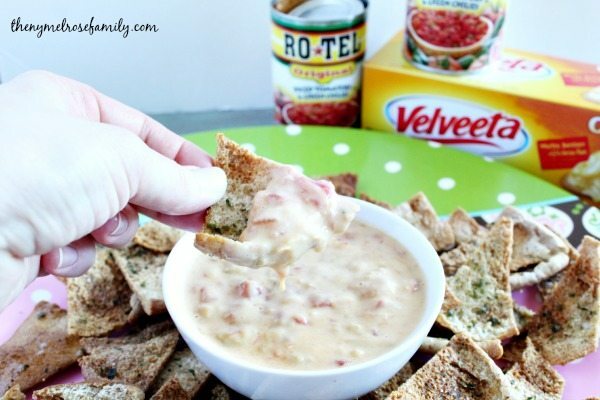 Cool and serve with the Ro*Tel and Velveeta Dip. While the chips are cooling get the dip started to so that you can serve it warm. You’ll need to place 8 oz of chick peas in a food processor with extra virgin olive oil and process the peas so that it has a paste like consistency. Add two cans of Ro*Tel to the mashed chick peas. Meanwhile, in a saucepan melt 8 oz of Velveeta cheese. Once the cheese is half way melted and in the chick pea and Ro*Tel mixture, stir until the cheese is melted entirely and everything is combined. For more inspiration be sure to check out Queso For All as well as Ro*Tel Facebook and Velveeta Facebook.